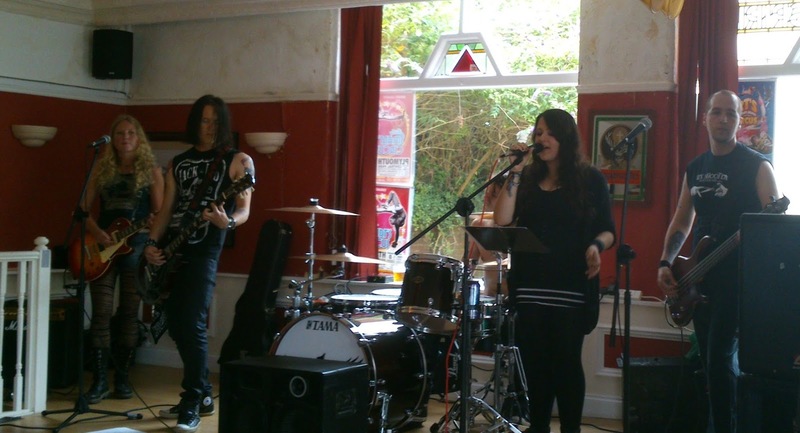 Carnival of Crows (previously known as Six Shooter) are a five piece from Plymouth who play blues infused hard rock. The band play with two lead guitarist which gives an impressive depth to their sound with both guitarist weaving riffs around each other. The band played at The Phoenix, Plymouth as part of a 'battle of the bands' type audition. Their set consisted mainly of covers including :- "Are You Gonna Go My Way" by Lenny Kravitz, "Whole Lotta Love" by Led Zeppelin,"Baba O' Riley" by The Who and "Paradise City" by Guns N Roses. The lead singer, Alex's vocals added something special to songs, which have been relentless played over the years giving them a more modern interpretation. The two original songs , "Moment To Decide" and new song "One & Only" were very powerful and showed a band defining their own sound after the many line-up changes. The band showed not only can they handle covers but can compose and write original music.The band were very professional playing each song in the set flawlessly, each member in union with each other. Unfortunately they were only playing a sub 30 minute set but we can expect full set on 3rd August 2013 at Freedom Fields, Plymouth. If you are going to see one local band this Summer make sure you go see Carnival of Crows.